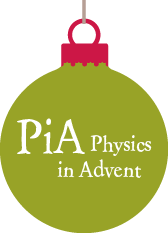 We gratefully acknowledge the transfer of user rights of the webcode from the German Physical Society to "PiA - Physics in Advent". We have taken the greatest care in compiling the content of our website. We cannot accept any responsibility for the correctness, completeness or topicality of the content, however. As a service provider, we are responsible for our own content on these pages in accordance with general legislation pursuant to § 7 Para. 1 TMG (German Telemedia Act). Pursuant to §§ 8 to 10 TMG, we as a service provider are not obliged to monitor transmitted or stored information from third parties or search for circumstances which indicate illegal activity. Obligations to remove or block the use of information pursuant to general legislation remain unaffected by this. Any such liability applies only from the time we become aware of a specific legal infringement, however. As soon as we become aware of such legal infringements, we will remove this content immediately. This website contains links to external websites of third parties over whose content we have no control. We therefore cannot be held responsible for this third-party content. The particular provider or operator of the website is always responsible for the content of the linked sites. The linked sites were checked for possible legal infringements at the time the links were created. It was not possible to recognise any illicit content at the time the links were created. It is unreasonable to expect the content of the linked sites to be permanently monitored without any specific indications of legal infringement. As soon as we become aware of any legal infringements, we will remove these links immediately. The content and materials on these pages which have been created by the provider Prof. Dr. Arnulf Quadt or operator of the website are subject to German copyright legislation. Contributions of third parties are identified as such. Any reproduction, editing, dissemination and any type of exploitation outside the limitations of copyright legislation require the written approval of the particular author or creator. Downloads and copies of these pages are permitted only for private, non-commercial use. The operators of these pages strive to always observe the copyright of others or use materials which they themselves have created or are free content. The data input by the users are stored and processed only for the purposes of the “Physics in Advent” project of the University of Göttingen. They are not passed on to third parties. The data are deleted again at the end of January of the following year. We would like to point out that the data transmission in the Internet (e.g. when communicating via email) may have security loopholes. It is impossible to completely prevent third parties from accessing the data. We herewith expressly prohibit the third-party use of contact data published as part of the obligation to provide legal information for the purpose of sending marketing and information material which has not been expressly requested. The operator of the website expressly reserves the right to take legal action in the event that unsolicited marketing information, such as spam mail, is sent.